Sage Gateshead’s music education programme brought together lecturer Birkett and Johnston, the guitar student. On this recording they have taken classic tunes on loan. Respect for the material permeates the CD from start to finish. From Jobim to Venuti, Eddie Lang and Lonnie Johnson to Rollins and Coltrane to Django, sensitivity and respect are paramount. Oleo, Giant Steps, Blue Room and Doxy, a mix of tunes, all of them handled with care, the craft of the jazz guitarist clear for all to hear. The sound balance is excellent, recorded at Sage Gateshead by Dan Martin and mixed and mastered by Adam Sinclair. Those familiar with the duo’s playing will recognise who’s taking the solo on any given track. Those less familiar will be impressed on first hearing and will want to search out the duo to hear them in concert. Purchasing Together is a recommended first step – James Birkett and Bradley Johnston Together (JBBJ 1). 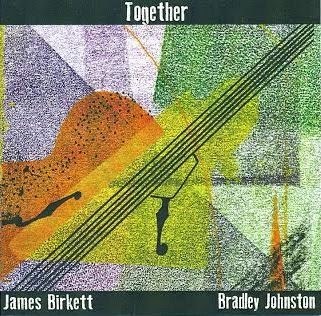 Buy a CD at a gig (be sure to get it signed, it is likely to become a collector’s item) or contact the guitarists at: www.jamesbirkettmusic.com and brad.believe@hotmail.co.uk.